I’ll also use this opportunity to sneak-in some views about collecting in general, my opinion on things like remakes and reproduction items, and a new UK TV show about people with huge collections. Lately, I’ve been watching the new UK TV series Collectaholics. As the title suggests, it’s a show about people who collect things. Lots of things. In some cases, without boundaries. 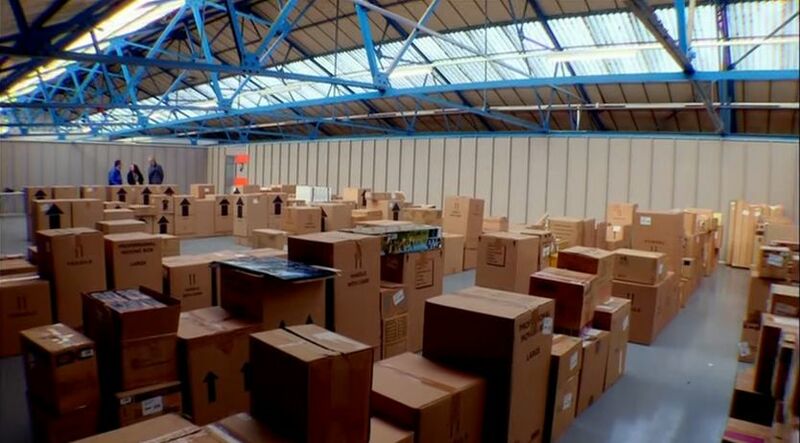 This image shows the collection in boxes, after it was moved out of a standard-sized family home and put into a warehouse. (Here’s the whole segment on Youtube). Each episode of Collectaholics features three enormous and unique collections, and aims to help each collector refine or improve their collecting in some way, such as by having an appraisal, re-displaying the items so they can be better appreciated, or reducing the size of the collection. The show has highlighted several vintage toy collections, so it’s worth watching for those alone. But often the psychology behind why people collect is just as interesting as the collections themselves. To offer another example… one man is attempting to collect every pop music CD ever released. He buys hundreds of dollars worth of CDs per day, and employs multiple staff to sort and organize them when they arrive in the mail. So far he has purchased 6 whole apartments just to house the 75,000+ CDs he has accumulated. All this and he rarely listens to any of the CDs. Clearly this is a case of “collect them all” syndrome – that catchcry you often hear in commercials. Taken to it’s extremes, collecting is no longer about enjoying particular items, or even having them. It’s about having all of them. The notion of “completing the set”. This is actually a very common motivation for collectors. But it becomes a mammoth task if your chosen subject is too broad. Which got me thinking about why I collect and what I like to collect. Luckily, I have no interest in completing sets, and I’m also fairly particular about what I like! Collecting is about having a passion for something and, to a certain degree, every collection must seem a bit strange to those who don’t share the same interest. For me, it’s about owning some nice pieces that exemplify my area of interest and it’s history. And while it relates mainly to vintage R/C cars, a lot of my “philosophy” about collecting (as detailed below) could really be applied to any kind of collecting – or in other words, if I collected something entirely different, I’d probably still take the same approach. And while I’ve written this article to serve as an example of what one collector does, at the end of the day I’m just that: one collector. And every other collector is going to have their own collecting preferences (including you). If you collect vintage R/C cars, you may agree with my approach, or you may not. But either way, and no matter what it is you collect, you should do whatever you find most rewarding. We only have one life, and only a few years in which we have the income (and the marbles) to enjoy a passtime like collecting. Obviously (!) I collect vintage radio controlled cars. Overall, when it comes to the cars, the items I find most interesting are: Electric Toy and Hobby grade R/C models from the 1980s – mainly the off-road vehicles, and mainly those made by Japanese companies. 1. Nostalgia. Like most people, I’m unwittingly a product of my era. When I was growing up in the 1980s, R/C toys were (to me) the most exciting toys available. 2. Realism. Because the concept of “radio control” was still relatively new in those days, toy makers focused on making R/C cars look very realistic. They had a great mix of design ingenuity, colour and fun about them, while often remaining very “scale”-like. As time passed, scale realism started to go out the window, and designers focused more on performance. Eventually, most R/C cars turned into boring, unrealistic blobs with 4 wheels and a fluorescent paint job. Of course they performed better than ever. But they usually had all the character of an ice cream tub. 3. Quality. 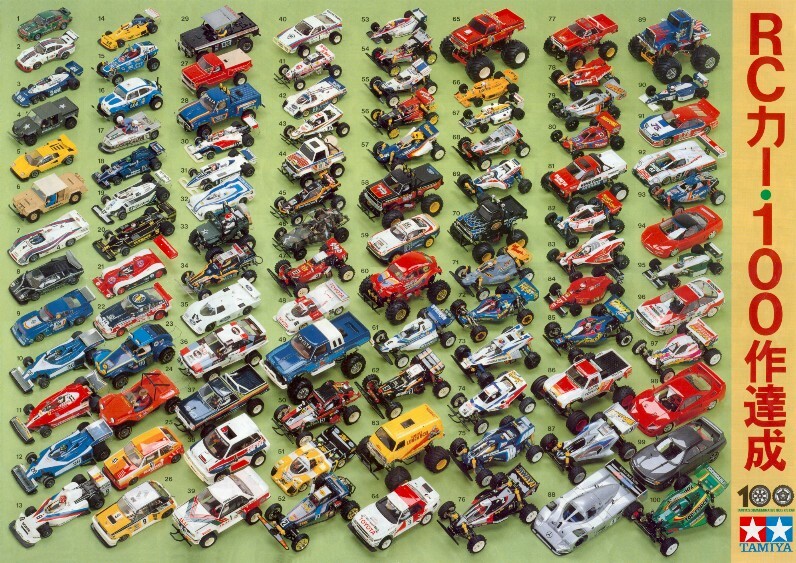 Almost every R/C car product of the 80s was made by Japanese, American and German toymakers. Not every item was great quality, but most were. To sum it all up: for a combination of reasons, the R/C toys of the 1980s were a phenomenon. The era was like a perfect storm in which the toys looked great, were new on the market, and (in hindsight) were very well-made and quite uniquely engineered. Between the years 1979 and 1986, it seemed just about every new electric R/C car release was a marvel of looks, design and construction. It all fell in a big heap in the early 1990s, when R/C innovation began to decline. Designs became homogenized. The market was flooded with boring cars. And video games replaced most hobbies involving physical toys anyway – leading to lower sales and many R/C car companies quitting or closing their doors forever. All of this just makes the “golden era” of electric R/C toys all the more fun to look back on, preserve, and enjoy. The first time I spent my own money on a vintage R/C toy, to add to something worthy of being called a collection, would have been in about 1992. Does everything I collect have to be vintage/original? Pretty much, yes. Almost every R/C item I have – from the cars themselves, to spare parts, to decals, right down to the screws, nuts and washers, is a vintage/original item as sold in the 1980s. I will also put a nice dividing line up between people that collect vintage, and people that just want something that looks vintage. And I tend to agree. For me personally, collecting vintage toys is about collecting vintage toys. Things that were manufactured and sold “back in the day”, around the time when I was a kid and couldn’t afford them. It’s about the fun of finding, owning and preserving those items you had (or wanted) as a child. No matter what kinds of toys you collect, you’ll probably be aware of remakes. A remake is when something is remade and relaunched (in changed form), in an effort to modernize it but also capture some of the demand that exists for the original thing. Movies often undergo remakes. And so do toys. Companies love to cash-in on nostalgia, and remakes have become commonplace. The concept is not new though. In some fields like pottery and furniture, remakes have been around for many decades. Among toys, in the past 20-30 years most toy makers have remade and relaunched just about every product line that was once a craze. You’ll also notice that in relation to toys, I used the word remake in preference to the word re-release. This is because when something is produced again in changed form, it’s not accurate to call it a re-release. To use movies as an example, if a movie is re-released, the movie you watch is simply the original movie back in cinemas again. For a toy to be re-released it would have to be identical to the original. Any toy that isn’t identical, is therefore a remake. In the past decade or so, Tamiya has been remaking some of their early R/C cars, and other brands have followed as well. But as with all toy remakes, they are not the same as the originals. Original new in box Tamiya Hornet. For me, it wouldn’t be an exaggeration to say that I grew up hoping that someday I would be able to own those classic R/C models that I used to pore over, in catalogues and magazines back in the 80s and 90s. When the Internet finally made it possible to search for original examples from the 1980s, there was no way I was going to settle for anything but the ones that had actually been around when I was a kid. Another factor here is that collecting is often fun in terms of sharing and discussing with others. You should only collect for yourself, first and foremost. But there’s not a collector in the world who doesn’t enjoy sharing their interests with others. And to be able to say some vintage item you have is original, is the preference of most. It just has more meaning. To use an analogy, some aspects of collecting remind me of when you travel overseas and visit famous landmarks dating back centuries, only to find out they’ve actually been rebuilt. When traveling the world a few years ago, I was amazed at how often a famous location or building would carry a plaque on the wall somewhere that read something like: “Original building circa 1805. Destroyed by fire in 1962. Rebuilt in 1965.”. Seeing this, I’d often think “why am I here?”. With the original landmark gone, the new structure is little more than a sad placeholder to keep the tourists coming. It has no provenance. Not that vintage toys compare in any way to famous landmarks. But on some tiny scale, the appeal of any collectible is connected to its inception, the memory of that era, and it’s provenance. For this reason, remakes feel a lot like those landmark placeholders to me. Reproductions are created when enterprising fans and enthusiasts feel there’s money to be made by cloning vintage items, using their own molds and plastics. They differ from remakes in that remakes are done by the companies who own the rights to the toys, whereas reproductions are generally done by other parties – such as individuals or small businesses, many of whom run the risk of copyright infringement. As the world braces itself for the era of 3D printing we can probably expect to see a lot of more reproduction stuff in the future. Personally, I have no desire to own reproductions, for the same reasons mentioned in relation to remakes. But I know life as a collector can be hard. And sometimes there are little bits and parts you need that you cannot seem to find – ever. So I can appreciate why some people turn to repro items. And yes, some original items are truly hard to find. On the other hand, many people do turn to repro items without really searching hard enough, in my opinion. Call me Ishmael, but… if I had a dollar for every person who has contacted me over the years searching for a rare item that they say they “cannot find anywhere”, but which I have seen sitting on eBay in recent weeks or months – well I’d have a lot more money to waste on toys. Collecting requires a lot of patience. You shouldn’t expect to find everything you want within a few weeks. Sometimes it takes months (or years) to find rare items. But if you set up saved searches, or talk to other collectors, and remain patient – even rare things can be found. And you just might enjoy the treasure hunt nature of it all, more so than buying readily available reproduction items. I’m a big fan of collecting vintage toys that are new in box. When something is still new, it’s a nice feeling to know that “here is an example of the item as it originally was when sold in shops”. And that’s all it really boils down to. Everything is clean and new, and may even remind you of the time you actually received one as a gift for Christmas, a birthday, or some other occasion. I wrote once before about the notion of vintage packaging, and how some people will pay more for perfect packaging. But this is not something I do. 1. Having a vintage toy with it’s original box, is great, and always better than having no box at all. 2. Having a brand new in box vintage item is the pinnacle. No matter what condition the box is in. – Boxes that are old and ruined can sometimes be repaired. – Boxes that are simply old from shelf wear, e.g. sitting in a shop window for years – that’s often lovely patina that makes the thing feel like a true leftover from the 1980s. – Boxes that are minty white and look like they were manufactured yesterday – well they’re nice too. And I do own some. But I would never pay crazy money for them. And then there’s the investment debate. Over the years I’ve seen a fair few people make the claim that if someone collects new in box vintage toys, and keeps them, and doesn’t immediately unpack them and build/use them, then they are “just investing” and/or “hoarding” – thus denying other poor fans the chance to get their share. Firstly, I can’t speak for everybody. I can only say that none of my collecting has been done for investment purposes. There’s a lot of fun in simply collecting and having, and not everything needs to be unpacked and used – for it to be enjoyed. Secondly, as for those people who do try to invest in toys, well… so? People can do what they like with their own cash. I don’t really begrudge those who try to invest in toys. It’s nice if they have a genuine appreciation for the items in question, rather than treating them like a portfolio. But in my experience, the latter type of collector is rare. Most people who collect toys, do so out of an interest in those toys. And if some of them end up being an investment, the profits they turn often go straight back toward funding their own collections anyway. And we ought to remember that those who cite “investing” as undesirable behaviour, may themselves (it has to be said)… simply be jealous of what other people have. I remember some years ago, a Tamiya collector (with a collection far larger than mine) told me he considered the really envious, spiteful people to be “the have-nots” of the world. Harsh perhaps. But unless you believe in a communist-style raid/redistribution of all vintage toy wealth, you have to accept that everybody is out there just doing whatever they can to get whatever they can. Grab whatever you can! But also, be thankful for what you’ve got. So, those are just some ramblings about my approach to toy collecting, and in particular the collecting of vintage R/C cars. As I said earlier, every collector has their own priorities and goals. You may not agree with mine in some way. The most important thing is to focus on what you enjoy the most. As always, feel free to add your thoughts below, and happy collecting! Well written 🙂 One additional aspect of collecting is practicality – for example, collecting full size cars would take alot more space than most ppl have available. My house space is overcrowded with rc hobby items, yet I still seem to accumulate more.. luckily, besides old rc stuff, I have a small collection of “AFX” slot cars, which takes up minimal room. Very true Dave, and I too sometimes wish I was a collector of something that takes up no space – imagine being a collector of, say, stamps? As usual, well written and and enjoyable read. I haven’t delved into my own psyche on what and why I collect per se, but I can say, if it has wheels, it has my attention. My wife would argue I collect far too much in the realm of RC and it is tripping her up everywhere she turns, but I won’t be appearing on an upcoming episode of Hoarders any time soon. I have seen I believe a Canadian show about a traveling appraiser of sorts where his realm is seemingly boundless. From Barbies to sports memorabilia, he seems to KNOW IT ALL. LOL I was just amazed at some of the collections he went on camera with to appraise. It was a fun show to watch, but it had me wondering if it really was that necessary to get that many things?? I know, I don’t have much room to talk according to my wife, but, I like to think I have drawn a line in the sand and moved on with my quest to rescue all old Tamiya parts from the dungeons of old musty and dusty hobby shops so that those same said parts could get back into the hands of builders to fix and restore or just as plainly, repair their old rigs back to a standard they could be proud of instead of thinking the car/truck was ready for the trash bin. GASP I like to think I am the tree hugger of old Tamiya cars, wanting to recycle, re-purpose or reuse them all, when they are found. I have collected some stamps and some HotWheels and Matchbox and other things, but mostly my collection is Tamiya cars of many vintages and states of re re or vintage. I collect what is in my eye appealing that argument could go on for decades about what cars look the best and which ones are modeled more appropriately, etc. I would also love to work on full scale projects, but that is limiting with space and my aching back as age progresses and takes away some of that youthful prowess I once thought I had. I hope to keep collecting what I like and that is all you really could ask for. In the same breath, I hope my wife doesn’t get so fed up with me she gets irate and never speaks with me again, so there is a bit of a grounding circuit that needs to be met with collectors so that reality can have a chance at sinking back in from time to time. I forgot to leave a side note on how you concluded your post with what I feel is my most sought after poster, the Top 100 replete with errors in sequence. I love the line up as Tamiya presented it and I giggle when I find that they didn’t get them in perfect order. I don’t have one of these photos/post cards or posters yet and I hope someday to find one. I can’t even say as I know if it exists on print versus digital image only. I recently found your blog and greatly enjoyed reading though some of your articles. It brought back fond memories of when I was a young teenager and saw for the first time, a Tamiya Hotshot that a neighbour had. I had never seen anything like it. It was like seeing a unicorn. When I think back then at seeing it run I was in complete awe and wished that I could afford to buy one. Back in the 80s they were so expensive and absolutely out of my reach. 20 years later I have become a full blown RC enthusiast with many RCs and love the hobby. Hi, Not a problem I enjoyed reading your articles very much. When I was looking through your list of vintage RC toys I noticed you sold a Taiyo Big Roader back in Feb of this year. Man that brought back memories! That was the first ever RC I had. I remember getting it as a Christmas present from my parents when I was a youngster. I absolutely loved that RC! I think it is still at my parents house somewhere. The other vintage RC I saw you sold was the iconic Tamiya Porsche 959 rally. I remember seeing that in a Tamiya Magazine, again when I was a teenager. I became obsessed about that 959 and wished I could afford to buy one. That particular RC was so sophisticated at the time (and still is) and expensive that it remained a dream to me. Some 10 years later when I was in my mid-twenties, the father of my girlfriend at the time came to me and said “Here Chris, do you want this, I was cleaning out my garage and was going to throw it out” It was… lo and behold… the Tamiya Porsche 959 rally in mint condition, apart from a poorly painted body shell! I couldn’t believe my eyes! He said that his son had moved away and didn’t need it anymore. Crazy hey. Anyway I still have it to this day. I plan on restoring it someday. Like I mentioned before, I am a big RC enthusiast. In my spare time I love to tinker away customising RCs and custom fabricating new components for them. I recently stated a blog called PROJECT RC which I document my projects to share with other enthusiasts. Wow, great story about the Porsche 959 Chris! One of those really lucky tales, and it sounds like it could not have gone to a better home. I am not a collector, I’m a 40 year old guy and got my first rc buggy in early 1983 when I was 7 years old, a grasshopper. It was great! I quickly became addicted, racing every week at local hobby shop tracks, and upgrading parts …then upgrading to better buggies….a hornet, a couple of frogs, hot shots, a super champ,an rc10, and just for fun, a couple wild willy jeeps. 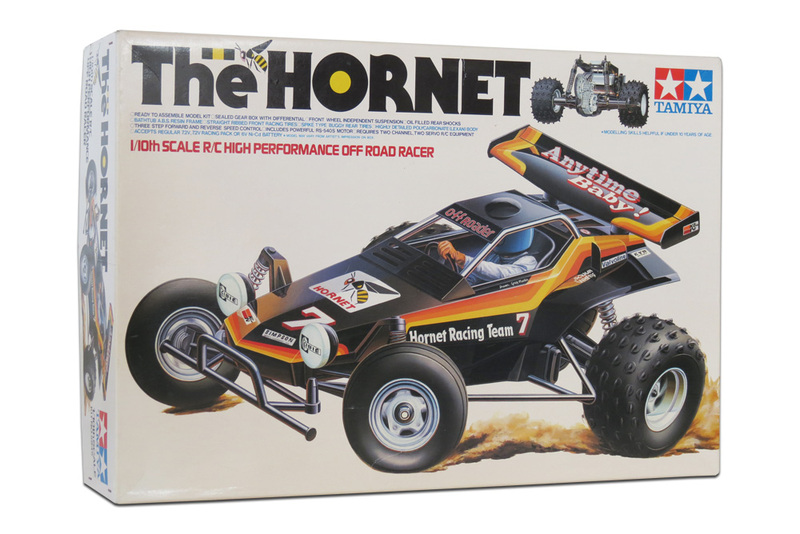 I no longer have the grasshopper and hornet, or any packaging or boxes…back then I never thought about collecting anything, just a kid that loved to race. Anyways, my son turns 8 next week, I put together a very nice frog for him, but now I’m wondering. …he’s gonna want to drive it hard like I did back then. Would it be better to get these remaining used, but in great shape, cars and spare parts into the hands of a collector, and let my son tear up a reissued model? Good question Fred. You’ll get different answers from different people. In my opinion, it only depends on what you want your son to experience. If you want him to enjoy an original Frog, and have the full warts-and-all experience you had with the original buggy (perhaps even with an original mechanical speed controller) then go ahead and do it. There are enough used original cars, parts, and even new original parts out there that you can always restore your buggy and keep it going. Provided he treats it with at least some respect and doesn’t completely thrash it, launch it off the roof, or set it on fire. If on the other hand, he really wants to bash hard, and you will flinch every time he slams it into a kerb or tree, then get him a reissue. They are a cheap way to experience an updated version of the car, and come with updated parts like electronic speed controls and updated drivetrains and fake sponsor decals. But naturally, they are not the exact same vintage experience. Alternatively, if budget allows, you could buy both, and get the best of both worlds. I appreciate your response, I am going to go ahead and give him the original. I’m thinking I’ll look up reissue parts for most common breaks…steering components, bumper mounts etc, and see if compatible with the original. If so, I’ll replace just those parts with reissue before anything breaks, then label and save the originals to put back later. I’m glad I found your site, great stories and helpful information. ..if you can tell me how to post pics here, I’ll take some and show you what I’ve got….everything I have, from the buggies, spare parts, upgrades, bearings, everything! Was bought at Hesperia hobbies in Hesperia Ca. between 1983 – 1986. I’ve lost a few cars and parts over the years, but have not added anything from any other era. So if I do buy some reissue parts for my sons frog, I’ll be sure to take extra care labeling the originals and saving them. Thanks again! Well done in taking such care to preserve your vintage gear by the way (and not mixing it with the abundant reissue stuff), and yes feel free to share some photos if you have time. Do you have a theory on why certain parts seem to defy all logic when it comes to pricing? I regularly see prices on eBay that cause me to wonder about the sobriety of the seller. These folks are either inexperienced, greedy, or don’t really want to sell the item unless someone is willing to overpay. Yet certain items seem to be marked up to a specific price point based on the ‘rules’ of the vintage R/C economy. For example, the USA-1 Nitro Crusher Counter Gear set ($75 – http://ebay.to/2mOiJBA). They always seems to be available, and new ones are usually in this price range. I have a couple of spares for my USA-1, and I’m tempted to sell them…but I don’t want to regret that decision if I decide to turn my display model into a basher, something I’m seriously considering. I still haven’t gotten over letting my NIB kit go for far less than it was worth when I needed some quick cash..now my chances of owning a shelf queen AND a runner are slim. Pristine examples are hard to come by. Back to my original question – my guess is that the counter gear is a weak spot on the truck, and therefore demand is increased while the market reacts to an ASSUMPTION of dwindling supply. Some of the prices have to be affected by speculation, right? I’m no economics major, but this particular part is one I’ve been watching for quite some time & I’d be interested in hearing your thoughts. Good question Jake. The main factor in all this is simply that some people research prices before selling, and others do not. Some experienced sellers will typically sell things at prices they are known to sell for, or a bit above or below that price. Such sellers don’t want to waste too much time waiting for an item to sell, but they know there is a precedent for a particular price point. And so, that item will get listed at around the same price, time and time again. Then you have the sellers who think that just because something is rare or unusual, it must be worth a vastly high figure – based on zero evidence. I hold nothing against people getting the best prices they can for what they are selling. But when you list something for $3000 when the only known sale price for that particular item is $500, then you are taking a flight of fancy into the clouds. Usually the market itself will correct these “outliers” by the fact that the item simply won’t sell. The third factor in all this, is somewhere between the first two…. In some instances where an item is not known to have a price precedent, yet is actually extremely rare AND desirable, then the seller might very well succeed with a high guesstimate price. I could give examples of certain vintage R/C kits that are SO rare, you won’t see one on eBay in 10 years. So nobody really knows the value of them. And if one does get listed NIB, then it’s up to the seller (and the market) to work out a value, due to no history of past sales. Nice car Joshua. Generally speaking, the place you will find most collectors will be eBay. But you could also try the trading area of the Tamiyaclub.com forum. I’m looking for a 90s vintage traxxas Hawk with original packaging if anyone can help please email.